The rain that has been falling for like 10 days in Lagos and Ogun states claimed two lives on Tuesday as a newly-wed teenager and a gatekeeper were killed in the states. While the teenager, Faisa, was killed in Agidingbi, Ikeja area of Lagos, the gatekeeper, 27-year-old Joshua Moses, was electrocuted on the River Valley Estate, in the Ojodu Berger area of Ogun State. Faisa and her husband, Muhammed, were reportedly married about 10 days ago in their village in Goza, Borno State, and had relocated to Lagos, before her death. It was learnt that the deceased was alone in the house when the incident happened. The corpse was recovered by officials of the State Environmental Health Monitoring Unit. A resident, Umaru Mate, said, “I went out very early this morning and returned around 10am. I was about going into my house when I heard a loud noise. “About 20 of us rushed there and saw that three houses had been destroyed by the mudslide. We were able to rescue a man, Umar, his wife and their five children. Another resident, Hassan Aji, appealed to the government to find a better place for them. Ibrahim Aliu, another resident, said they paid N24,000 per year as rent to some men who claimed to be working for the Lagos State Government. According to Punch, the River Valley Estate incident occurred on Abiodun Bada Street. The man, Moses, was electrocuted at about 6.30am. He had opened the gate for his employer to drive out when an electric pole fell on him. The rain had weakened the foundation of the pole which made it to fall on Moses, who reportedly resumed work in the apartment on Monday. It was gathered that immediately the pole fell on him, the gatekeeper was electrocuted. 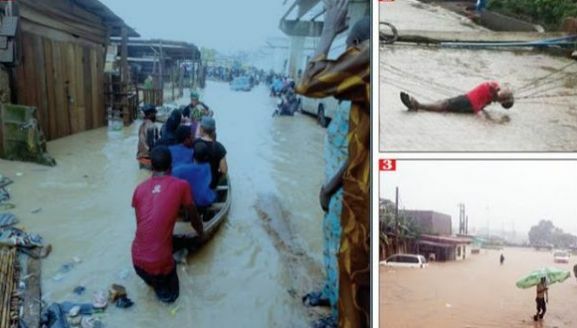 Many other areas of Lagos and Ogun suffered flooding as a result of the rain. RIP to the dead.